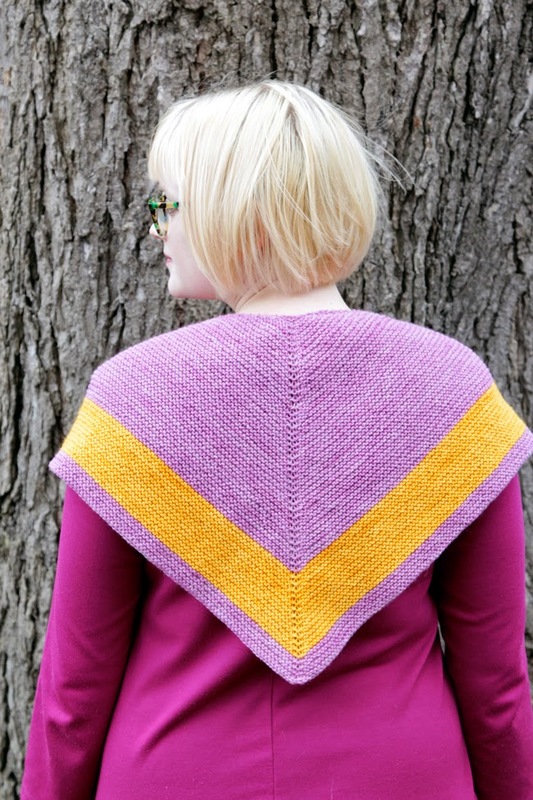 This month, we are proud to have sponsored YarnCon, Chicago's Indie Fiber Festival. To celebrate, we're featuring another Chicago-based knitwear designer, Heidi Gustad of Hands Occupied. Heidi is a part-time librarian with a passion for all things crafty. 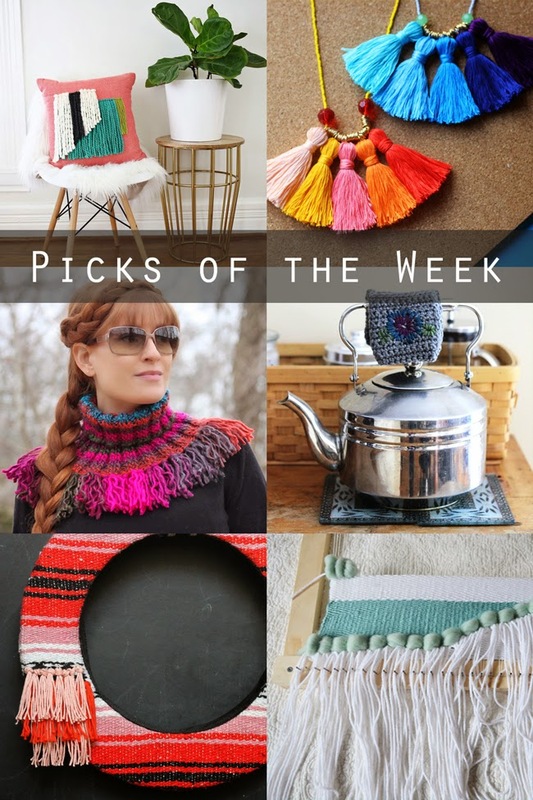 On the Hands Occupied blog, you'll find knitting and crochet patterns and tutorials, project ideas for other yarn crafts, and plenty of inspiration, too! Crafters of all skill levels will find lots of useful information, from the Knewbies tutorials to tips and tricks geared towards more advanced knitters and crocheters. I first learned to knit at age 8 from my grandma who saw in me an anxious kid who could benefit from a relaxing hobby. Plus, I was a total freak for crafts as a kid - it made perfect sense. While I didn't fully latch on to knitting regularly until I was in high school, I have technically been knitting for almost 20 years, despite being 27. I started designing my own patterns for myself in college, but it didn't occur to me to start sharing my patterns, let alone start publishing my patterns, until a couple years ago. I ultimately became a designer because of my blog, Hands Occupied. I started the blog when I was 23 as a way to more actively participate in the online crafting and DIY world. What I wanted to do from the beginning was really start a knitting blog, but I was too chicken. I blogged about general craft tutorials and inspiration for the first couple years of my blog. During those years I learned how to code so I could make my own changes to my site as needed, I learned how to take decent pictures, and I learned how to market my content online. What was missing from the equation those first couple years was the level of passion I feel for knitting and crochet design. About 18 months ago, I started blogging knitting patterns since, dammit, that's what I wanted to do. I think I just had to get to a certain age to get the confidence (and skills) I needed to finally take the plunge into design. The blog gave me a chance to put patterns out there for free, which gave my readers the chance to share what they liked or didn't like about a given design and let me know if I made an error in my pattern, which was a really effective way to learn quickly what pitfalls to avoid in designing! It was interesting how much my experience marketing general craft DIYs like Mod Podging fabric on a shelf helped in marketing my patterns. The photography experience and social media network have proven especially useful. I like to make patterns that are practical. Of my free blog patterns, the most popular have both been cowls that I designed during the deepest, coldest days of Chicago's last two winters. One, the Faux Woven Cowl, was designed to be virtually windproof for my husband's daily walks to and from the train he takes to work. And the Long John Cowl was inspired by my need for extra warmth on my own way to work, but it also rolls down to be worn as a neck warmer when my workplace is freezing. How do you balance your own design/blogging career with your part-time job as a Librarian? Do you have any helpful hints for ways to maximize crafting time for those who are pressed for time? The first few years I blogged, I was working full time in libraries and attending grad school. I also got married and moved to Chicago from Michigan in there one year too. That was shenanigans. I thought that it was necessary to be sleep deprived and ultimately a little unhappy in order to pursue any career, especially a creative one. I don't recommend that. If you get a full hour for lunch, bring something you can eat in 15 minutes. Then plug in some headphones to zone out with your craft for the other 45. If you can take transit or carpool, do! I bring knitting and crochet on the train all the time. I recommend avoiding DPNs since those can drop and roll away from you, but circulars and crochet projects can be your commuter crafting BFF. If you get frustrated by a never-ending project, consider alternating working on those with an easy-to-finish project like a chunky hat or socks or mittens. Switching up your routine can help you feel more productive and avoid frustration, particularly when time isn't on your side. Use a calendar. When I was in grad school, working full time and blogging too, I would schedule myself time to create, even in just half hour chunks. I'd try to create for a little while after work but before I shifted to homework time to help give myself a mental break. If you're in school, particularly if you're taking online classes, knit while you watch your lectures. Crochet while you get reading done via audiobook. It takes some balancing, but you can find little bits of creative time without losing sleep! 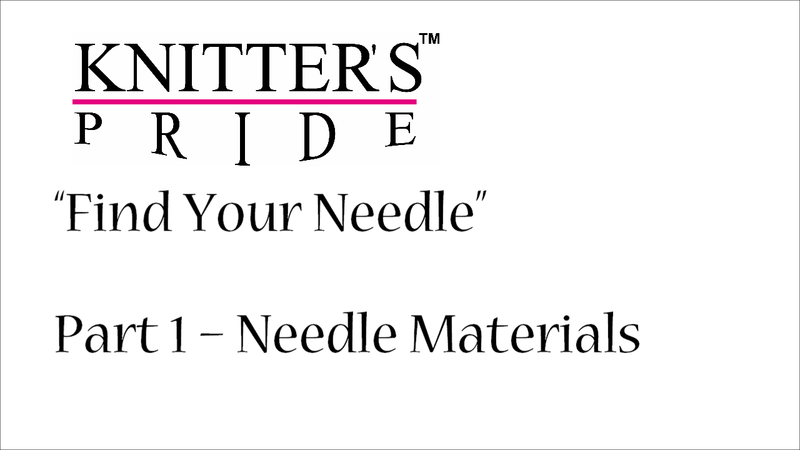 I'm going to my first needle arts industry conference in May, and I couldn't be more pumped! I hear I will come away with some excellent design inspiration and lots of new friends. The first time I designed a baby blanket, I completely took for granted that what I thought was a piece of cake to make could just as easily be translated into a written pattern. That was a big, facepalm-inducing moment for me that helped me really understand the process behind designing and proofing a pattern. Nothing feels worse than when a dedicated reader and internet knitting friend ends up confused when they trust you and your work as a designer. Luckily, my blog readers are amazing and ended up teaching me a lot the first few months I released patterns on my blog. Nowadays, I've published a few patterns in print, have signed with a book agent and am opening my own indie pattern shop online, and thanks to the feedback from readers, I know what they like about my designs and how to work with a tech editor and test knitters! 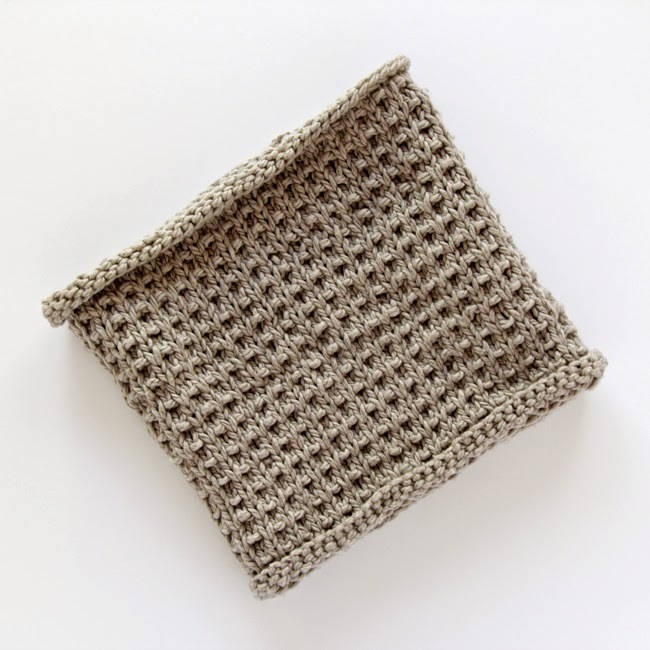 Congratulations to AnnBan, who won a Waves Crochet Set in this month's giveaway. We will get in touch with you to arrange for the delivery of your prize. Be sure to visit the Hands Occupied blog for another chance to win a fabulous prize from Knitter's Pride! Olek is a polish-born fiber artist. She is best known for covering large pieces, including people, buildings, statues, and more with crocheted pieces. One of Olek's recent projects has been a collaboration with St+art India foundation to create India's first ever crochet installation. 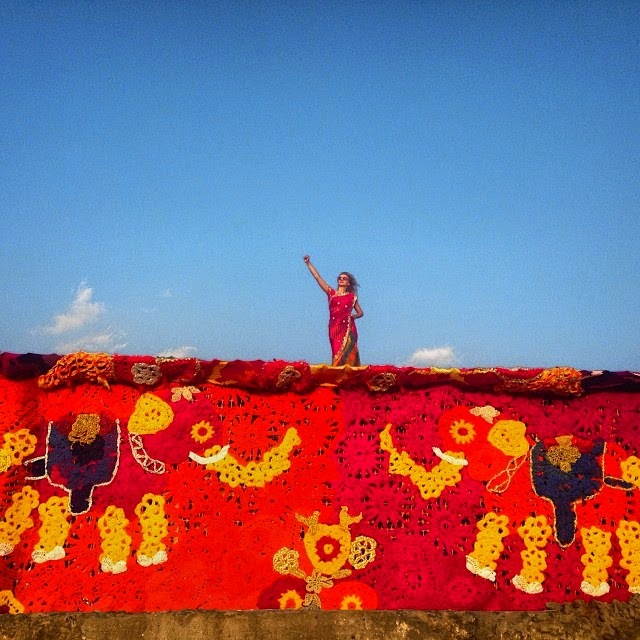 AllKraftz has partnered with Olek and St+art India foundation to cover an entire women's shelter in crochet pieces. 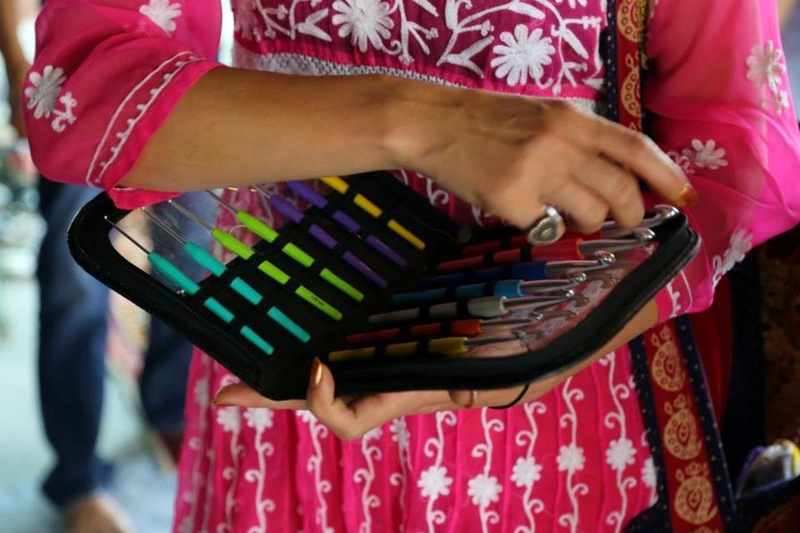 AllKraftz, the Indian retailer for Knitter's Pride and KnitPro products, donated crochet hooks for the entire project and sent 14 women from the KnitPro factory to work full-time on this project. Olek also visited the KnitPro factory where all Knitter's Pride and KnitPro needles and tools are crafted. Olek was a pleasure to work with and our team in India greatly enjoyed their experience working with her. 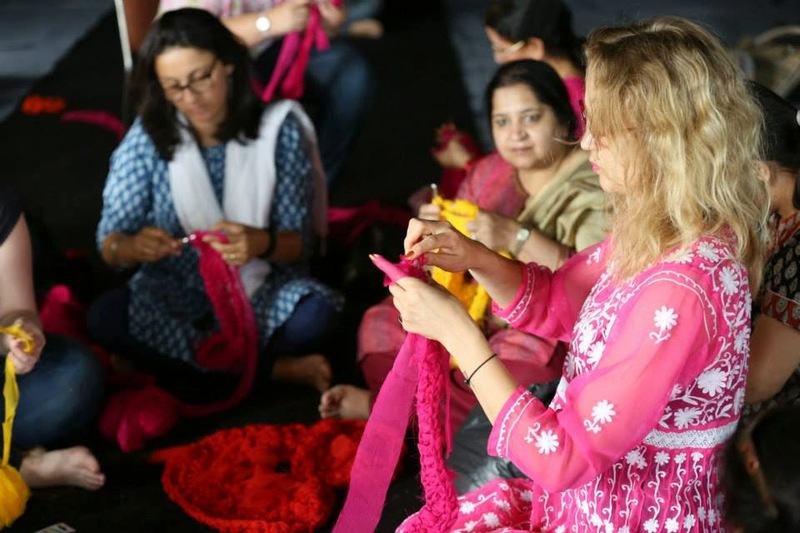 In India crochet is seen as a craft done by women in more remote areas and at home. She told the women to crochet freely and make whatever pieces they'd like--she didn't want to dictate patterns but wanted each woman to express herself. She told stories about her experiences working with people in different countries and the crafty women of KnitPro also enjoyed sharing their stories with her. 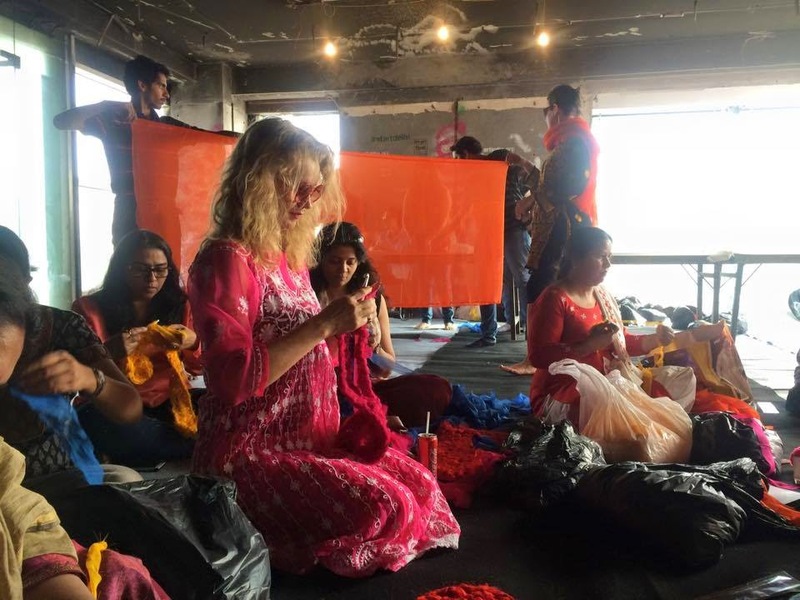 The final project to cover a women's shelter in Delhi took 60 people 3 weeks and around 90 kilometers (over 50 miles) of fabric! You can also read a wonderful article about the project that was featured in the Huffington Post here and see more photos in the article from Juxtapoz Magazine here. This month we're giving away a Waves Crochet Hook Set to one lucky blog reader. To enter to win share with us what inspires you to craft. Don't forget to leave us your Ravelry ID so we can contact you if you're one of our lucky winners!